December, 2012 Class and Component prices were posted on January 3, 2013. 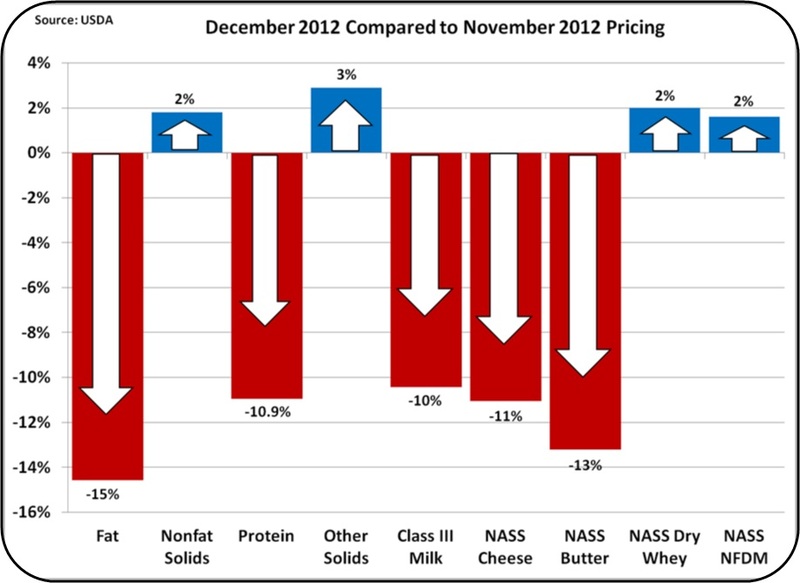 As expected cheese and butter prices declined bringing milk protein and milk fat prices down. 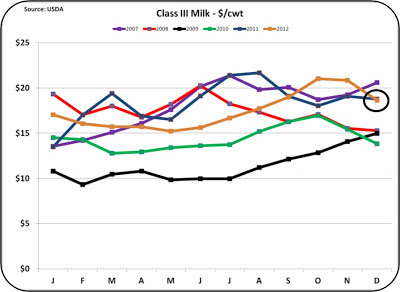 The Class III milk price was $18.66/cwt, down from the last two months, but still good. Very importantly, the fundamentals of high exports, low inventories, and favorable exchange rates indicate a healthy market. After the October and November record prices, December's price was a significant drop. 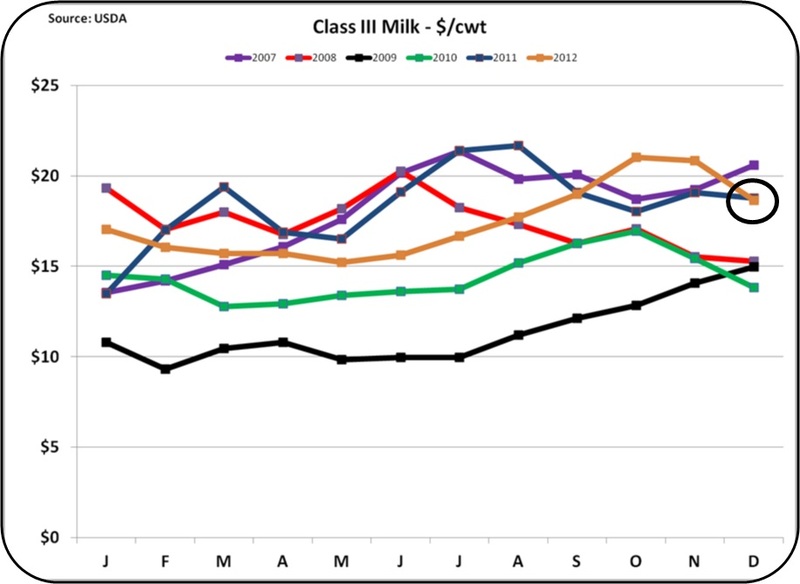 The December Class III milk price of $18.66/cwt was not a record, but it was a good price The extremely high December, 2007 price was clearly better, but this month's price is still one of the best prices for the month of December. The component values that make up the Class III milk price of $18.66/cwt was based on the continuing dominant value for milk protein, a declining value of butterfat, and a very significant value for other solids. Cheese and whey from cheese making currently make up 68% of the milk check. 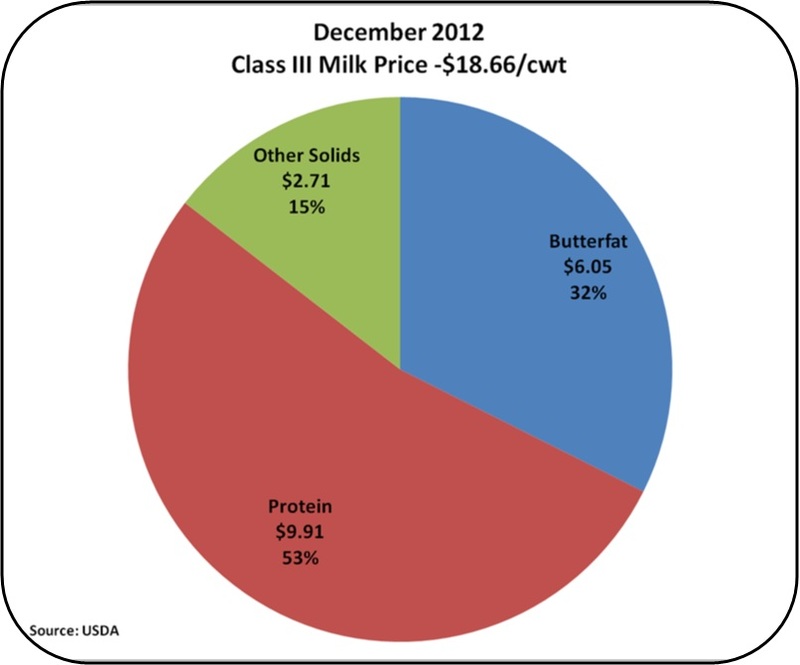 A dairy producer really needs to emphasize milk protein to maximize his income. 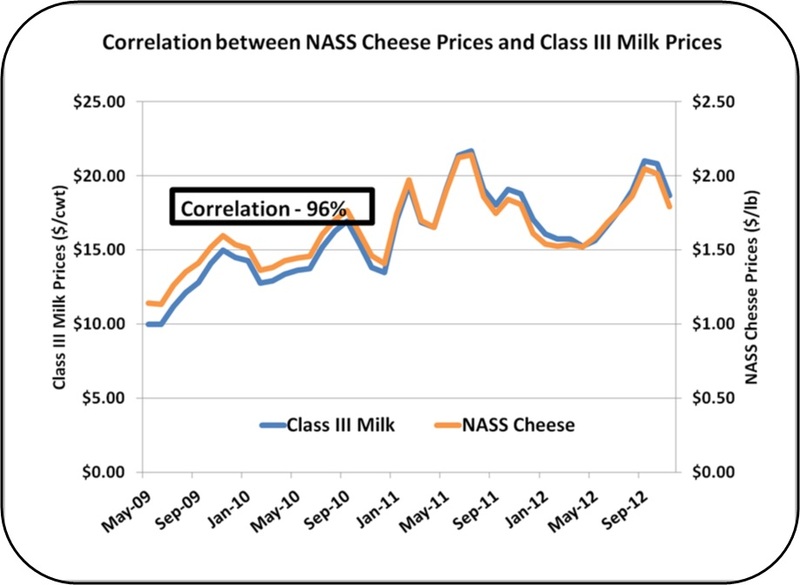 The dominant relationship of cheese on Class III milk prices continues. The correlation of 96% confirms this relationship. However, there is one detail that is shifting. 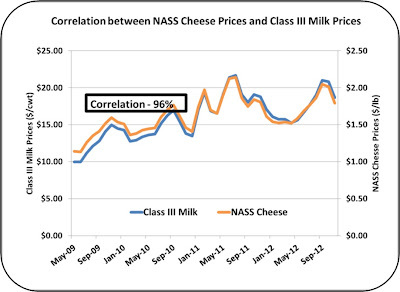 While the correlation continues to be strong, the price of Class III milk is more positive than the relationship would predict for Class III milk prices. (The blue line in the chart below has changed from being below the yellow cheese line to being above it.) This reflects the increasing value of whey, and therefore other milk solids, over the last 4 years. The value of Other Solids is based on the price of whey. Whey is finding many good uses in food products and this has put pressure on inventories. 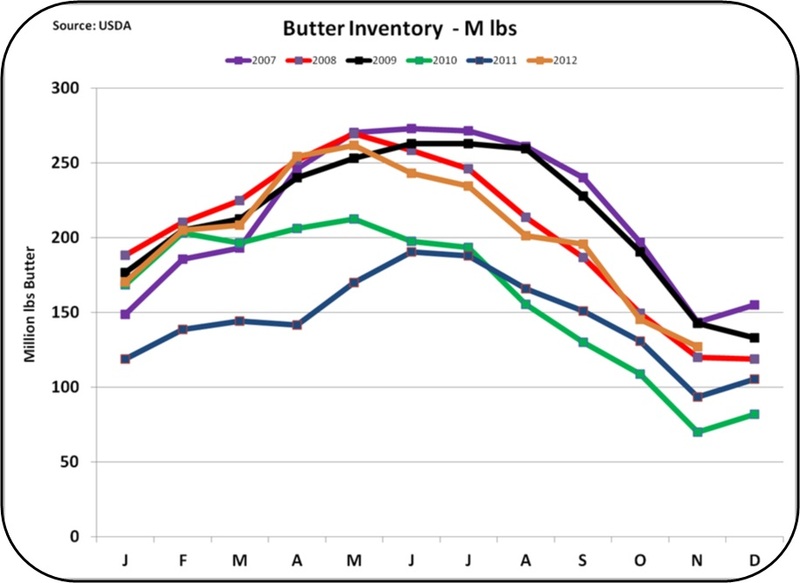 To illustrate this, the chart below shows that inventories are currently at a six year low for this time of the year. This can be further illustrated by the trend during this same six year period. 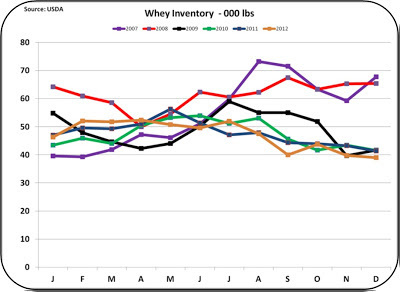 Whey inventories have dropped consistently over this time. 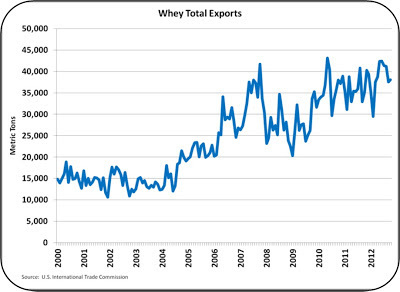 Exports of dry whey also continue to show strength. 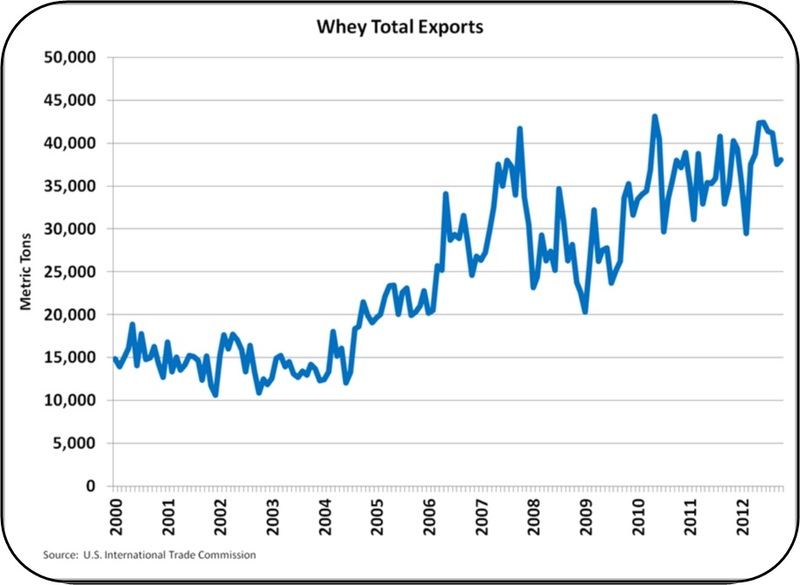 As discussed in the last post to this blog, dry whey disappearance is driven largely by exports. The exports continue to put pressure on inventories which results in higher prices. 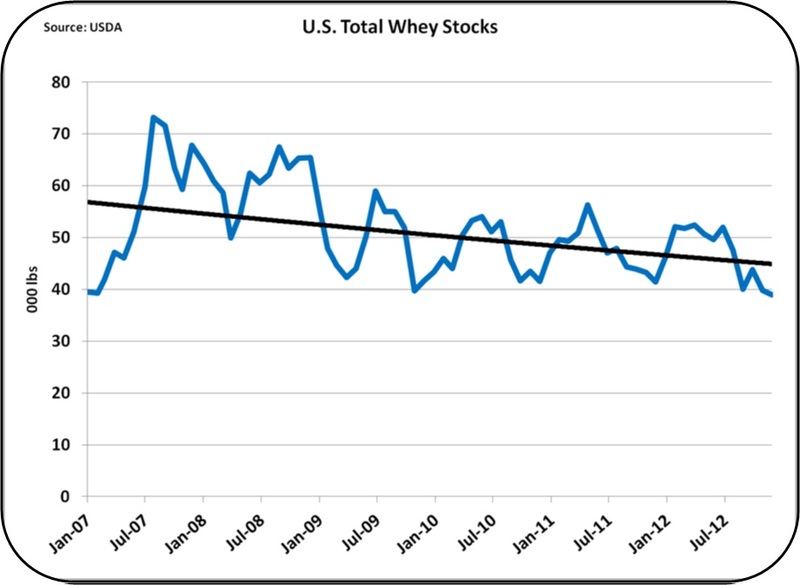 So far the higher prices have not dampened the usage of whey. At $.66/lb it is still a good value. 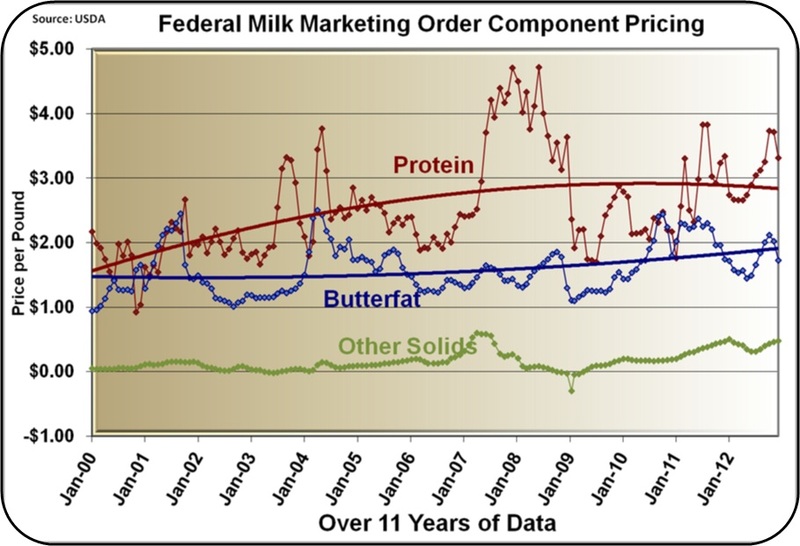 The lower price for cheese has had a direct impact on the price of milk protein. 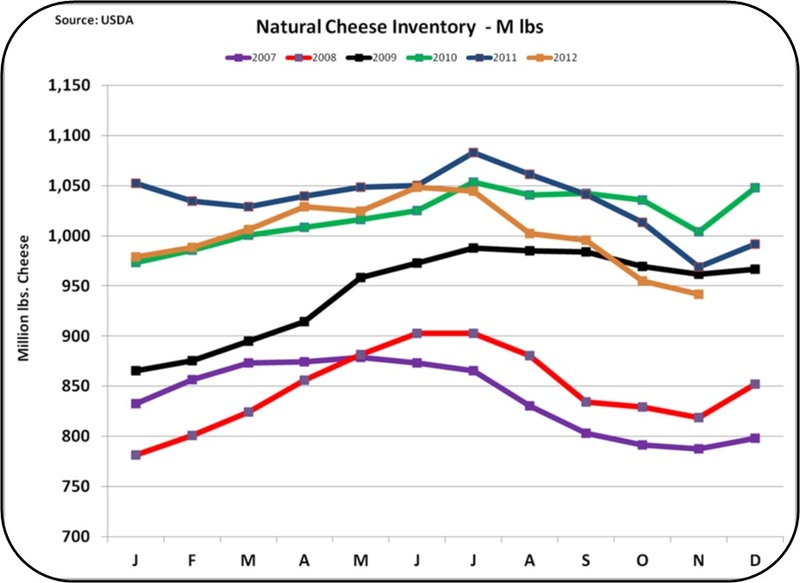 However, as mentioned in the prior post to this blog, there is little to support the drop in cheese prices. 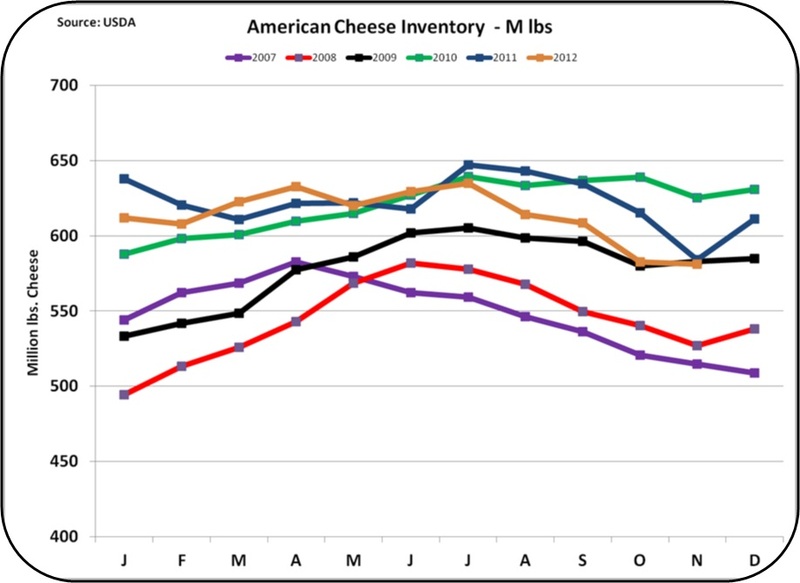 As shown below, the inventories of Natural and American Cheese are near 2009 levels. 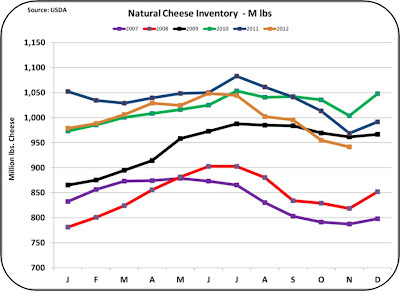 This is in spite of the increases in cheese production, domestic consumption, and exports. As inventories are depleted, prices usually go up. In the last two months. the opposite has happened. While markets are only partially rational, the current price certainly does not seem rational. 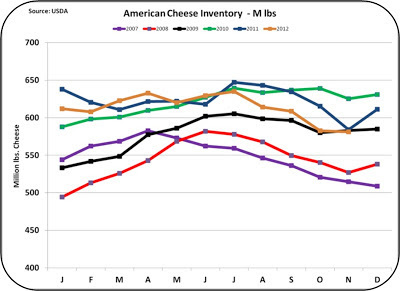 That would leave the conclusion that cheese prices will likely escalate or at least not drop further. Butter appears to be reaching normal levels of inventory and therefore normal levels of pricing. 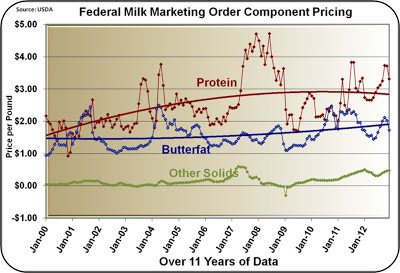 Domestic per capita consumption of butter remains stable as it has for years. The only growth is due to the U.S. population growth and export growth. Inventories seem to be at reasonable levels, so there is little reason for price changes. 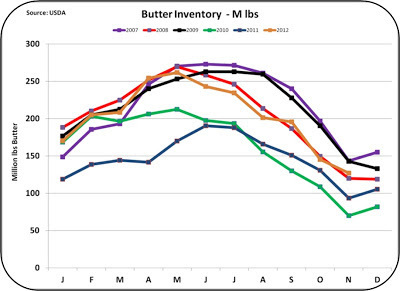 Butter prices will probably remain stable in the near future. 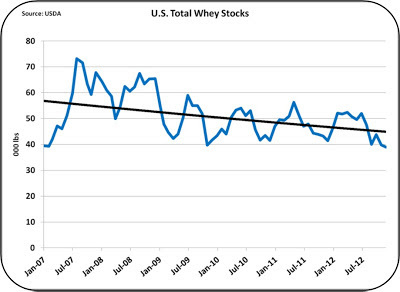 There is a positive environment in the near future for dairy prices. The new U.S. farm bill was passed and the dairy fiscal cliff has been avoided. Exchange rates remain positive and inventories of dairy products remain tight. Class III futures remain in the $18 to $19/cwt range. There should be very little pressure for further price reductions and a reasonable chance of higher prices.